Calendula Pink Surprise Calendula Officinalis is a flowering annual herb. Calendula Pink Surprise seeds can be started indoors for early bloom, and also known as Pot Marigold, this Calendula produces double flowers that have an outer border of soft orange with a circle of yellow color around the button centers and unique light pink accent. Calendula blooms throughout the entire season, and its multicolored flowers attract butterflies, hummingbirds, and bees. Calendula Pink Surprise is ideal for sunny gardens and pots, and Pot Marigold is an easy to grow plant for borders and containers. Calendula Officinalis seeds have to be covered with 1/4 of inch with soil. Pot Marigold performs best in full sun and moist, well drained soil. 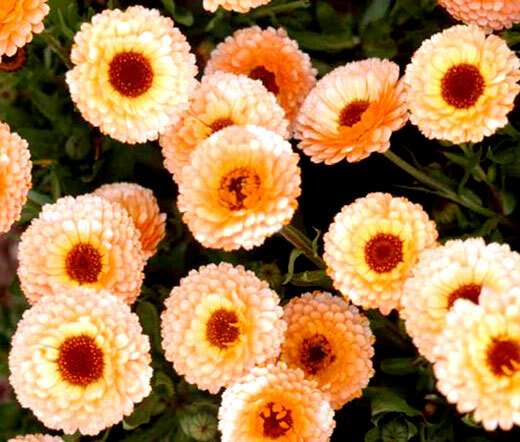 Not only Calendula Pink Surprise is a delightful cut flower, but it is also the edible culinary herb, and its petals can be used as a substitute for saffron, or can be added to dishes such as salads.